Dainty & sure to inspire beautiful baby clothes. 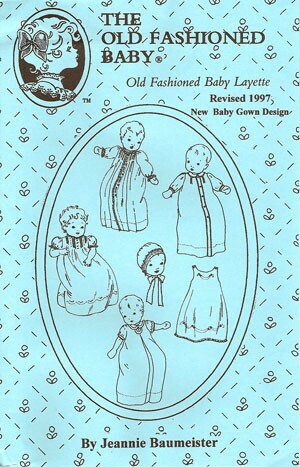 This pattern has been revised to include 6 sleeve styles on the exquisite daygown. Whether you choose to make it simple or elaborate, baby will look wonderful! Button in the front version can be finished w/tuckes, lace & embroidery, the button in the back can have a center pleat w/a cute little front tab or elegant w/lace & tucks. Bonnet & slip pattern included.